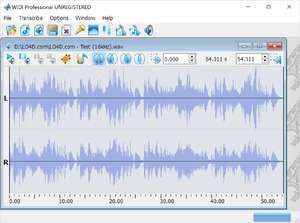 Music Recognition System Pro is designed to automate transcribing of music. That means that the task of retrieving music score from an audio record, which is usually accomplished by a hard work of a professional musicians,is about to be solvable by a PC. You can take you favourite audio record and convert it into notes. It allows both monophonic and polyphonic conversion. WIDI Recognition System Pro 4.3 is a shareware program and can be used as a demo to try the software until the free trial period has ended. A full version of the program is available after the trial period ends. For security reasons, you should also check out the WIDI Recognition System Pro download at LO4D.com which includes virus and malware tests. Additional screenshots of this application download may be available, too.